PBLA/PBMA – Aluminum baffle is formed of aluminum for precise parabolic contours. Baffles are available in standard finish of semi-specular silver. Other optional finishes are available. Center to center spacing of cross baffles can vary to achieve desired shielding. Standard overall panel dimensions shall range from 3” x 48” to 12” x 48”. Baffles can be furnished in different styles. 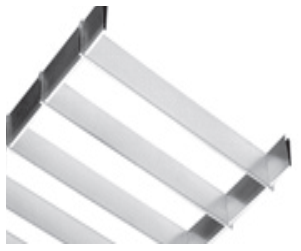 For use with perimeter, accent and corridor lighting. Baffles are made to order and set up fee’s may apply. Diffuser Specialist, assumes no responsibility for suitability of these materials in any luminaire or application. Please test for fit and function prior to ordering project quantities. Subject to changes without notice.